We are planning to ship our very first release of Octopus Server with long-term support (LTS) in Q4 2018. This post explains our plans for Octopus Server in an LTS world, and how you will benefit. We also explore some of the background to this decision and some of the mechanics we'll use behind the scenes. We think a lot of self-hosted customers will want to predominantly use Octopus Server releases with long-term support, but if you use self-hosted and want to keep right up to date with everything we're doing, you can keep enjoying that cake too! How Do You Choose What to Include in an LTS Patch? Can We Move Between the Slow and Fast Lanes? Will You Maintain the Monthly Cadence for Fast Lane Releases? Will You Change Your Versioning Strategy? We will ship a new release of Octopus Server with six months of long-term support on a three month cadence. This means there will be two current LTS releases at any point in time. Get critical bug fixes and security patches for up to six months. Not get new features, minor enhancements, nor minor bug fixes - these will roll up into the next LTS release. Installing a patch should be safer than not installing that patch. You should use the same rule of thumb when deciding whether to install a patch onto your Octopus Server. We will announce each new LTS release of Octopus Server in a blog post with the LTS tag, clearly stating which releases are still covered by long-term support, and releases where long-term support has expired. Each release of Octopus Server will clearly indicate if it is an LTS release on the downloads page and inside the product itself. We realize not every customer is the same. We want to make it really easy for anyone to answer this question: What is the best release of Octopus Server to install? We want to give you the power to choose, along with simple guidance to help make an informed choice. Under the covers, we plan to keep working the same way we have for the last several years: shipping bug fixes and minor enhancements with a quick turnaround and working closely with our customers to design and test new features. What we are adding is a special release cadence, where the release is based on the most stable version at that point in time with some additional quality assurance, complete with the offer of six months long-term support. The fast lane is exactly what we do today. We ship new features when they are ready, usually every 4-6 weeks, and ship bug fixes and minor enhancements into patches every few days. The slow lane is where we will stabilize and ship releases with long-term support, along with any patches containing critical bug fixes and security patches for up to six months. Octopus Cloud customers will be using releases from the fast lane: we make the choice for you. You will get the latest and greatest features as soon as they are ready, along with the quickest turnaround time on bug fixes and small enhancements. Self-hosted customers can decide for themselves. We recommend choosing a lane and sticking with it, but you can switch lanes when it suits your situation. "We prefer stability over having the latest features." "We upgrade Octopus about every three months." "We evaluate Octopus in a test environment before upgrading our production installation." "We want the latest and greatest features and really fast turnaround on small enhancements and bug fixes." "We want to engage closely with the Octopus team, so we can help them build the best automation tooling in the world!" I've covered the broad details of our long-term support program, and I'll answer some common questions here. If you have any questions at all, please feel free to ask in the comments! We discover a security vulnerability which will result in us raising a CVE report. We discover a show-stopping bug where there is no viable workaround. We discover an issue which is only present in a current LTS release. We discover something which just makes good business sense to patch. Ship hundreds of LTS patches - we want stability and a high signal to noise ratio. Ship new features in LTS patches. Ship breaking changes in LTS patches. Yes, you can switch lanes in a controlled fashion. "Accelerating" to a fast lane release will result in you running a higher version of Octopus Server - it's just a normal upgrade. If you would like to "decelerate" back to the slow lane releases with long-term support, just wait until the next LTS release is shipped and upgrade to that release. We currently ship releases on an approximate monthly cadence. We think a predictable cadence is more important for customers using the slow lane releases with long-term support - it will help them plan their upgrades. 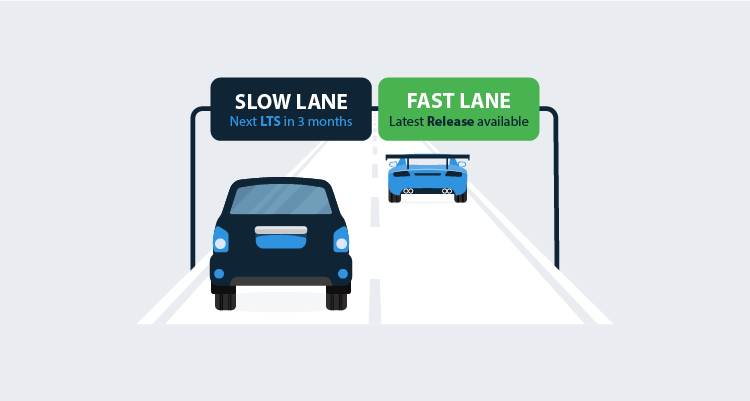 In the slow lane we will aim to ship LTS releases on a strict three month cadence. In the fast lane we will aim to ship new releases on a monthly cadence, however, sometimes we may decide to ship a fast lane release earlier, or take some extra time to harden a fast lane release before shipping it. If you prefer a more predictable cadence choose the slow lane releases with long-term support. We will add LTS to some part of the version for releases which come with long-term support. Let's imagine a possible future based on our current plans. Please don't bet the farm on these exact dates, version numbers, nor features lists - this is just an example to help you imagine how our release history might look after a while, and how these will map to your scenario. 2018.7 shipped in July 2018 primarily with support for workers - see release notes. 2018.8 shipped in September 2018 with support for multiple packages in steps and Kubernetes support in alpha - see release notes. 2018.9 ships in late September 2018 with the Kubernetes support in full release. 2018.10 LTS ships in early October 2018 based on the most reputable release of 2018.9 (including Kubernetes support, excluding Spaces because that comes in 2018.11). This release comes with six months of long-term support. 2018.11 ships in late October as the first installment of Spaces. 2018.12 ships in late November with battle hardened Spaces and other good things. 2019.1 LTS ships in January 2019 as the next release with six months of long-term support rolling up all the good things we did since 2018.10 LTS. At this point in time both 2018.10 LTS and 2019.1 LTS will be covered by long-term support. Notice the version numbers are not really the important part - it's the LTS component and the offer of support which really matters. 2019.2 ships in late January 2019 with more good things. 2019.3 ships in February 2019 with, you guessed it, even more good things. 2019.5 LTS ships in April 2019 as the next release with six months of long-term support, rolling up all the good things we did since 2019.1 LTS. At this point in time we will discontinue support for 2018.10 LTS, with 2019.1 LTS and 2019.5 LTS becoming the two current releases covered by long-term support. One thing you might notice in this imagined future: there were three fast lane releases between 2019.1 LTS and 2019.5 LTS. We plan to ship fast lane releases at our discretion, and we plan to ship a new LTS release on a three month cadence. The most important part is to choose the releases from the best lane for you, and don't pay too much attention to the version number attached. Hopefully this imagined future helps clarify our plans. We are introducing long-term support (LTS) for Octopus, and you can bank on it. If you have any concerns or questions, please reach out in the comments below!